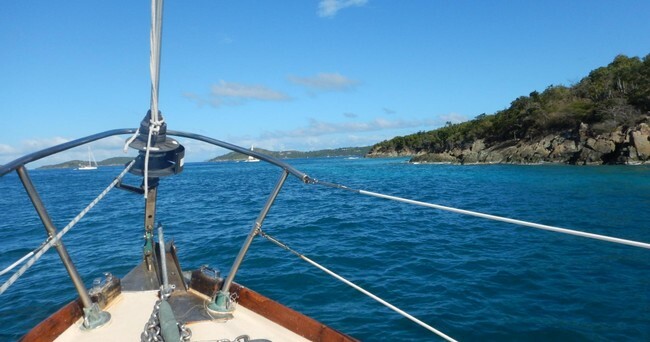 Sailing the Caribbean on a classic cruiser to secluded locations around St. John and other Cays. Snorkeling vibrant coral reefs, swimming in crystal clear water, lounging on a gorgeous beach, or relaxing on deck with an ice cold beverage. Great food and plenty of champagne with the magnificent St. Thomas coastline as your backdrop. The perfect venue for our guests to enjoy the serene, blue, waters to relax and sunbathe or take the helm of our 40 ft sailboat. Snorkeling, swimming and enjoying the sun with amazing sea life and white sandy beaches of some of the most incredible shoreline on the planet. A protected and smooth sail through the national park and breathtaking views of the sun setting over St. Thomas and the surrounding islands and cays. We will take you to an amazing five site near either Lovango Cay or Christmas Cove with each dive lasting approximately 30-40 minutes. • Seating up to 6 passengers – so there is never a crowd! • Open bar all day featuring our own specialty island drinks. • Snorkel gear, rafts, and floats always available and complimentary for our guests. We can now accommodate up to 12 guests in a Regatta sail with two boats! 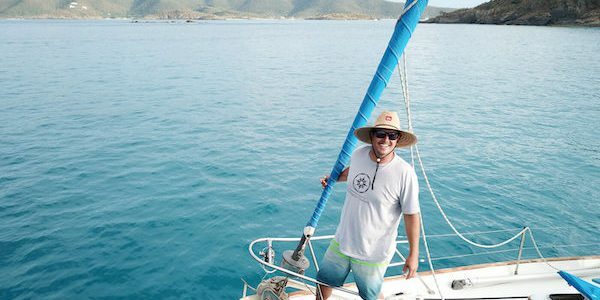 Let Captain Mike take you on our 41’ classic wooden boat for an unforgettable day of sailing and fun on the beautiful Caribbean Sea. We provide all snorkeling gear and treat you to a delicious lunch featuring grilled fare and a very open bar. Morningstar has teamed up with several the most talented Staff and Dive Masters available to make us a one stop shop! We offer an array of things to do during your stay in the Virgin Islands. Our safety oriented, knowledgeable and experienced staff will show each of our guests a day of classic sailing coupled with amazing snorkeling and scuba diving! In addition to our wonderful staff and classic sailing, we offer scuba equipment (for certified divers). Whether your tastes are adventurous or more laid back, let our friendly staff assist you in planning where your imagination can take you. Our family owned, family operated, company has it all: island hopping tours, snorkeling, sailing, site seeing, private party’s, scuba diving and much more. Whatever you choose, our staff will give you exactly what you need. 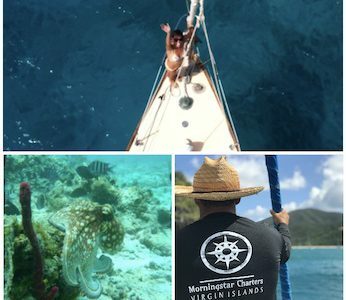 Newly added: In addition to our very popular snorkeling trips, Morningstar Charters now offers guided scuba excursions to many destinations! We offer some of the very best scuba diving in the Virgin Islands. We offer Daily Dives, Dive Packages, Night Dives, Wreck Dives as well as full day Dive Trips! Our staff is happy to help you schedule your personalized itinerary or place you with other guests in our “Mixed Party” to ensure a wonderful day at sea. We will take you to dive sites like the Ledges, the US National Park, the Wreck of the Rhone (passports required) as well as dozens of secluded islands and beautiful bays. Please fill out our Guest Inquiry Form for a detailed schedule and locations. We will respond quickly as we want our exclusive dive destinations to remain just that, exclusive (no crowds).